Aiming to provide twice the detection range with less color sensitivity than its previous generation of sensors, Banner Engineering introduced two mid-range adjustable-field sensors to the WORLD-BEAM QS30 family. The QS30AFF400 foreground and the QS30AF600 background suppression sensors use advanced linear imager technology to provide a high level sensing solution for myriad industrial applications, including part-in-place detection, feeder bowl control and package detection on conveyors. 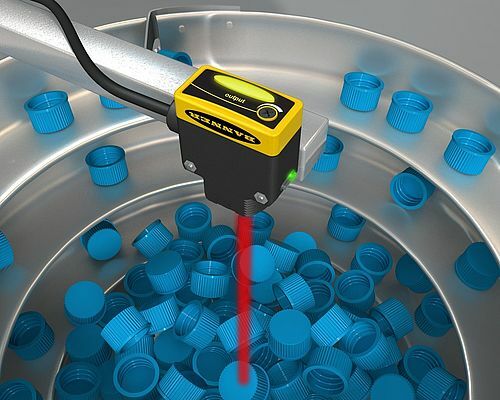 The use of a 128 pixel camera (linear imager) makes QS30 sensors resistant to mechanical shock and vibration, enabling advanced image processing to maximize the range and minimize the effects of target color. The sensors also have high crosstalk immunity and can reject fluorescent or other spurious light signals, allowing multiple sensors from the company to be used in close proximity to one another. The QS30AFF400 delivers reliable detection of target objects varying in color or shape when a fixed background is present. Conversely, the QS30AF600 provides reliable detection of objects when the background condition is neither controlled nor fixed, and it ignores objects located beyond the sensing field cutoff. The sensing range, for all models, can be adjusted with a four-turn screwdriver potentiometer or via the remote teach wire input. Additionally, the sensors’ visible red LED sensing beam ensures easy sensor alignment. Suitable for use in even the harshest of industrial environments, the sensors come in a waterproof, epoxy encapsulated IP67-rated housing. Providing a variety of mounting options, including a 30 mm threaded barrel or side mount, they deliver increased flexibility to meet diverse applications. Three connection options - 2 m, 9 m quick-disconnect and 150 mm pigtail quick-disconnect - are also available. Additional features include precise and repeatable switch point performance; large, bright output and sensor status indicators; full assortment of convenient brackets and cordsets for simple installation; and bipolar discrete outputs, PNP and NPN, with optional LO/DO selection in every model. The QS40AFF400 offers an adjustable cutoff range of 50 to 400 mm, with a maximum sensing range of 400 mm for all sensor colors. The QS30AF600 delivers an adjustable cutoff range of 50 to 600 mm, with a maximum sensing range of 400 mm for the 6% black card sensor and 600 mm for the 90% white card sensor. The 6% black card sensor also offers a minimum sensing range, also known as the dead zone, of 30 mm.